This week’s edition of Saturday librarian was slightly delayed, but worth it. Promise! I know. I KNOW. Clearly a basement, and that’s fine, but that was awful. It was wonderful they had carved out a corner, but you have to be a very dedicated musician to practice in such quarters, and most do not when the weather is nice. The first thing to do was get the music instruments to a safe location for the duration. No pictures here, but suffice to say they hung out in a nice, sheltered corner of the library for a few hours. You can really only see a fraction of the music instruments, and you can barely make out the two pianos. Yes, there are TWO! Glorious– if you can rearrange things enough to pull out the bench. First order of business? Those shelves in the middle had to go. They were chock a block full of periodicals. a view into the room, boxes visible and work begun. A better view of the room before beginning. 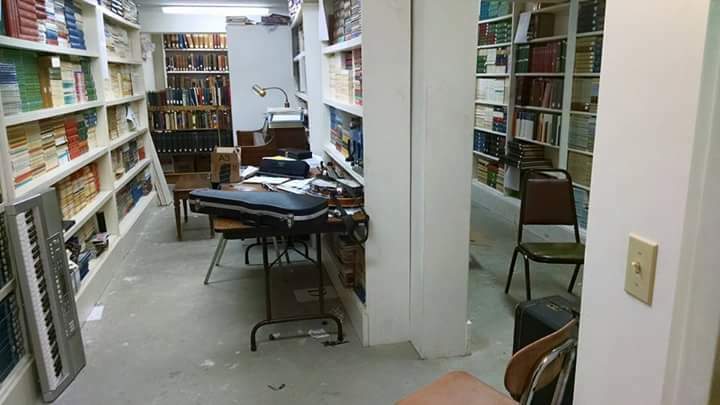 Notice the periodicals hugging the ceiling, and the piano now visible behind the table. 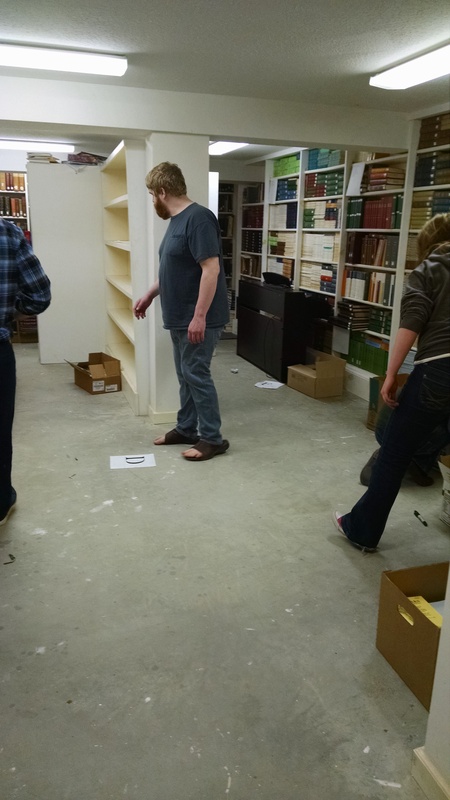 If you’re going to unload four shelves’ worth of periodicals, there have to be boxes in which to store them. Believe it or not, we had stored two weeks worth of boxes from the various orders coming into the cafe. Surely that would be enough? 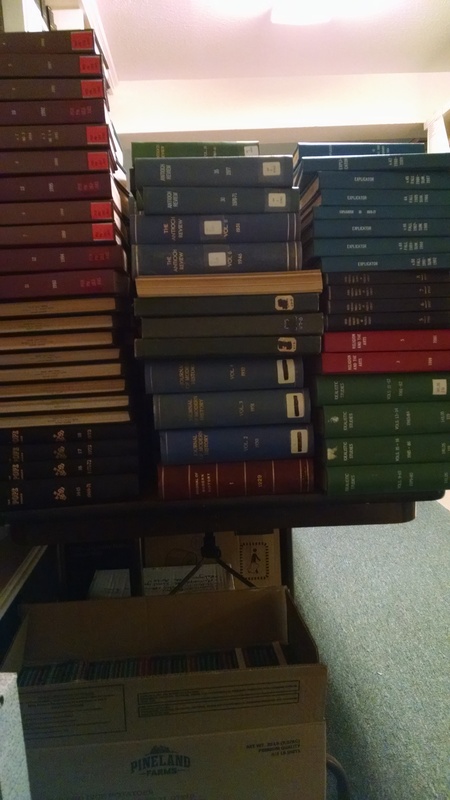 We had enough boxes for the softcover periodicals. The hardback periodicals traveled in packs for safety. The short answer was no. There not nearly enough boxes for our work Saturday. My (naive) hope had been that we could start to pull books from the side shelves and get the music and art collection into the room. It became clear quickly that Saturday’s work would largely comprise making the room functional for a group of musicians to practice together. The library is a wonderful building, but many libraries before ours have run into the question of how to store so many physical serial volumes. There are no compressed stacks in the building, no way to roll shelves up against each other to save space. 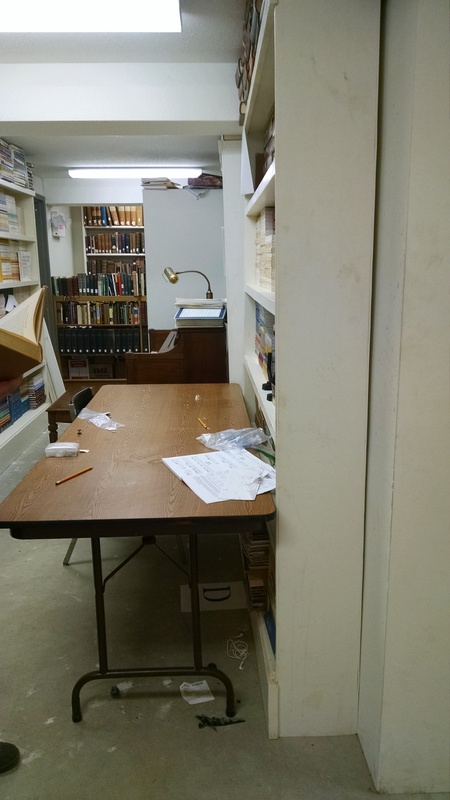 As such, the periodicals are now in the basement of the library, boxed or resting on the table, waiting for faculty review. I had mentally prepared myself to be working on this all day. Fortunately, quite simply, our students ROCK. We had more helpers than we could use when all was said and done. Phase 1 was complete by noon, a scant two and a half hours after we began. For the next half hour after, I had people coming into the room ready and willing to help, only to find nothing to do. I wouldn’t say nothing, though. I asked all of the students who came to go in, sit down and play. To see whether we needed more chairs, whether the sound was better, whether the room felt better. The musicians I could get to try the refreshed space were ecstatic– they could breathe. I go back and forth on whether to add a rug in the center of the floor– it would help warm the space (which is unfinished concrete) but would it negatively impact the sound? I told all those who entered to try it out, to add as needed. I was told not to worry; it never seemed to matter, furniture finds a way. 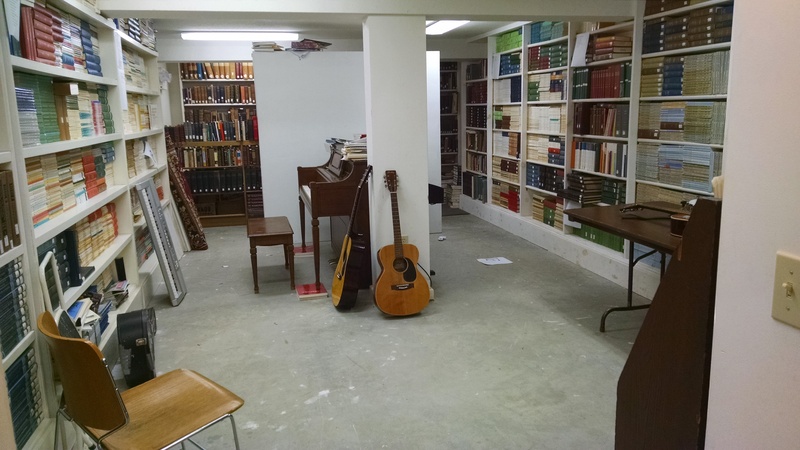 My hope is that as we gradually weed through the periodicals (and/or open up storage space), we’ll be able to get the art and music collections in. 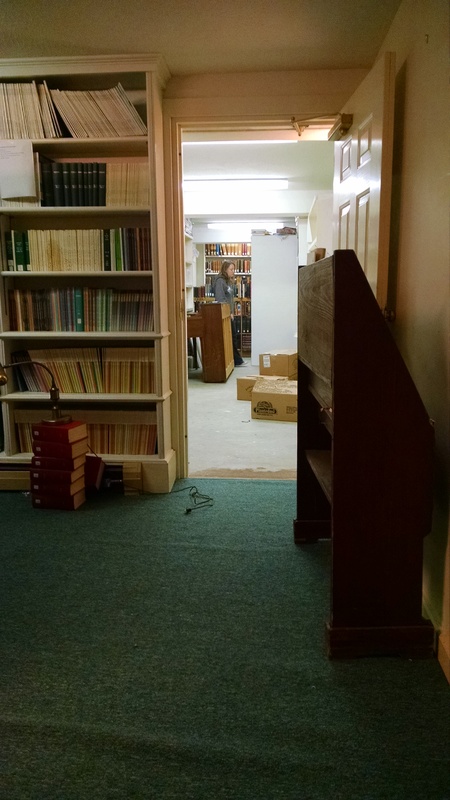 In the very back of the room, you can sneak a peek at some of our older volumes. They’ll be getting a new home too– just as soon as I replenish my box supply.